The midfielder collapsed during the second half of the club’s pre-season friendly against Werder Bremen on Saturday. Nouri made his senior debut for the club last year. AJAX HAVE CONFIRMED that Abdelhak Nouri, the club’s 20-year-old midfielder, has suffered ‘serious and permanent brain damage’ after he collapsed during a pre-season friendly last Saturday. The Netherlands underage international was airlifted to hospital in Innsbruck, Austria after suffering a cardiac arrhythmia during Ajax’s game against Werder Bremen. Ajax said on Tuesday that Nouri would be gradually awoken from an induced coma by doctors, and the Dutch club this afternoon confirmed the awful news following more detailed tests. “Ajax are deeply saddened by the news that Appie Nouri has been diagnosed with serious and permanent brain damage,” a brief statement on Twitter read. 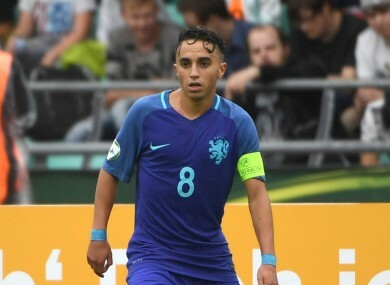 Nouri, one of Ajax’s up-and-coming prospects, made his debut for the 33-time Dutch champions in September last year during a cup against Willem II. He was also named Jupiler Player of the Season 2016-17 for his contribution in the second-tier Jong Ajax or “Young Ajax” team. The young midfielder has represented Netherlands at every age level from U15s and most recently featured for the Oranje’s U19 side, scoring nine goals in 19 appearances. Email “Ajax confirm 20-year-old Abdelhak Nouri has suffered 'serious and permanent brain damage'”. Feedback on “Ajax confirm 20-year-old Abdelhak Nouri has suffered 'serious and permanent brain damage'”.